With nearly 750 of its 1,000-strong regiment captured in the first two years of Civil War, the remnant could have found themselves dispirited and drinking from the poisoned well of desertion, and with its final chapter written, each soldier merely fading into the ages. But this is a story about a regiment that suffered 75% casualties in nearly two years with 44% becoming fatalities as they withered away in a putrid prison in the North. Regiments are generally remembered for battlefield feats such as the valiant charge breaching the parapet, dislodging the stubborn foe, and lifting the enemy's standard while shouting the rebel yell. The 62nd is scarcely remembered because of its atrocious losses from diseases in a Northern prisoner-of-war camp, but rather for one event that demanded a response just three days before Lee surrendered to Grant during the closing scene of the conflict. Having evaded capture in the Cumberland Gap when Confederate forces capitulated on September 9, 1863, the remnant of the 62nd would pursue and clash with bushwhackers and raiders before being assigned to Palmer's Brigade at Asheville on March 10, 1865. Far from Thermopylae and lacking a single Spartan, the tested 175 remaining Tar Heels of the 62nd, of their own free will, now formed the nucleus of 300 men who would make one last stand. Joined by senior and junior reserves, some soldiers at home on leave, convalescent troops recovering at Asheville, and an artillery battery consisting of two Napoleons, the scant yet determined force would march into battle to defend Asheville in early April, 1865, from an approaching Union brigade consisting of 1,100 battle-hardened veterans. The 62nd North Carolina Infantry Regiment was formed in the mountain community of Waynesville, North Carolina, on July 11, 1862, and was composed almost entirely of men from Western North Carolina. Its members were recruited in the counties of Jackson, Haywood, Clay, Macon, Rutherford, Henderson, and Transylvania. The field officers were colonels George W. Clayton and Robert G. A. Love, and Lieutenant Colonel Byron Gibbs McDowell (often misspelled Bryan), and they were all descendants of Revolutionary War soldiers. Colonel Robert Gustavus Adolphus Love, known by many as R.G.A. Love, initially served as a captain in the 16th North Carolina Infantry in the Army of Northern Virginia. When Captain Love received his promotion to colonel he transferred to the 62nd North Carolina. The city of Waynesville, where the unit had formed, was founded by Robert Love, an ancestor of Robert G. A. Love. Major (later lieutenant colonel) Byron Gibbs McDowell was a native of Macon County, and in early 1861 he enlisted in the 39th North Carolina under the command of Col. David Coleman before being transferred to the 62nd by promotion to Major of the Regiment on July 11, 1862. This regiment would spend much of the conflict providing a necessary yet thankless defense of the region's vital and strategic railroads, and their associated bridges and depots, as well as the prized Saltworks located in neighboring southwestern Virginia. The unit initially served and fought in East Tennessee, but after two consecutive surrenders of 295 and 442 soldiers respectively, the remnant of the organization, numbering merely 175 men, would reform in Asheville, North Carolina, and serve there for the remainder of the war. In late December 1862, while guarding bridges and railroads in East Tennessee, three poorly armed companies (295 soldiers) of the 62nd North Carolina were overrun and captured by a well-equipped Union cavalry force of 3,000. In July 1863 the regiment was attached to General Gracie's Brigade and stationed in the Cumberland Gap. In a concerted effort, the 58th, 62nd, 64th, and 69th (Thomas' Legion) North Carolina regiments fought the enemy in East Tennessee and across the border in western North Carolina. General Ulysses S. Grant, while traveling through the Cumberland Gap in 1864, noted that "with two brigades of the Army of the Cumberland I could hold that pass against the army which Napoleon led to Moscow." Major McDowell, 62nd North Carolina, when referring to the Cumberland Gap in early September 1863, stated: "When I was told by General Frazer that I had been surrendered, and that I and my regiment were prisoners of war my indignation and that of my regiment knew no bounds. I informed him that I would not be made a prisoner of war that it took two to make such a bargain as that under the circumstances, and that he could not force me to do so. Sharp words were exchanged, and I called up all of the Sixty-second Regiment who were willing to take their lives in their hands and all of the other commands in the Gap who were willing to join us, and said to them, 'If you will go with me we will go out from here, and let consequences take care of themselves.'" Although Confederate General John Wesley Frazer would, without offering any resistance to the foe, surrender the regiment in the Cumberland Gap on September 9, 1863, an estimated 600 from various units evaded capture after refusing to obey Frazer's capitulation order. After the uncontested fall of the Gap, the 62nd North Carolina would return to the Asheville area and in April 1864 it recorded 178 men. 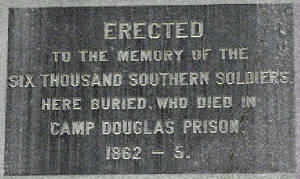 The records further indicate that a staggering 442 men of the 62nd were surrendered by Frazer and held as prisoners at Camp Douglas. And in O.R., 1, 30, 11, pp. 636-637,* Major McDowell discusses the Cumberland Gap's surrender, with President Jefferson Davis endorsing the report by stating that Frazier's surrender "presents a shameful abandonment of duty." *Official Records of the Union and Confederate Armies; hereinafter cited as O.R. Major McDowell was the only 62nd field officer present during the surrender of the Cumberland Gap. During the capitulation, Colonel Love was ill and not present (North Carolina Standard, October 7, 1863), and Lt. Col. Clayton had contracted typhoid fever and was in a hospital in nearby Greeneville, TN. In Jan. 1865, according to O.R., Series 3, Volume 4, p. 1037, and just three months prior to Lee surrendering to Grant, imprisoned 62nd North Carolina men were offered pardons if they joined the Union Army. Although most of the imprisoned men of this unit had already succumbed to an agonizing death at Morton, known as the Andersonville of the North, McDowell wrote that not one soldier from the 62nd accepted the offer. The 62nd, now greatly reduced in numbers, would continue trekking the rugged terrain while fighting and scrapping with a variety of determined opponents, from outlaws, deserters, bushwhackers, outliers, to escaped Union prisoners. Fighting against bushwhackers and guerrillas had now replaced the standing army in the field, but most men, if given the choice, still preferred fighting in pitched battles using Napoleonic Tactics. Bushwhackers were by definition masters of the ambush, but they were considered by the masses as murderers because they refused to engage in civilized warfare, meaning a gentlemen's fight. The guerrillas, however, were only striving to even the odds with their hit and run tactics against a much larger and better armed force. War is war, kill or be killed, so like a clap of thunder out of a clear sky they attacked and like a ghost in the night they vanished. In early 1864 Captain B. T. Morris of the 64th North Carolina (known as Allen's Regiment) recorded that while fighting bushwhackers, McDowell had been shot through the arm. (The 64th would forever be associated with the Shelton Laurel Massacre.) The 62nd continued the fight under generals Breckinridge (14th Vice President of the United States and cousin to Mary Todd Lincoln), Vaughn, and Williams in East Tennessee. Whereas in March 1865 the regiment was attached to Colonel J. B. Palmer's brigade at Asheville, the unit soon disbanded near the French Broad River. A Confederate Victory at the "Battle of Asheville"
The 62nd North Carolina was one of the state's last regiments to surrender during the war. 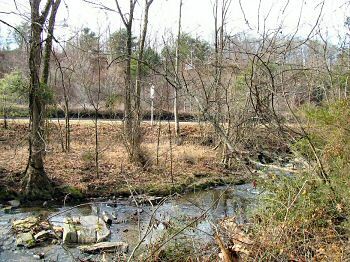 With the fragment of the regiment forming part of Palmer's brigade at Asheville on March 10, 1865, and at the direction of General Martin, it engaged and thwarted Kirby's brigade near Asheville on April 6. Prior to disbanding this regiment, Col. George Clayton gathered the scant force of 300 Confederates and two small brass Napoleon cannons and marched them to rough earthworks on a hill that overlooked the French Broad route being used by the advancing 1,100 soldiers under the command of Ohioan Col. Isaac Kirby. When the two forces engaged at 3 o’clock in the afternoon, they held their positions and began firing. There was no maneuvering, but gunfire, with sporadic cannonading, which continued for five hours. On April 3, 1865, Colonel Kirby, formerly commanding the 101st Ohio Infantry, was ordered to advance his 1,100 strong brigade, with ten days' rations, from East Tennessee and capture Asheville, if he could do so without suffering high casualties, and he was assisted by Confederate deserters familiar with the terrain. Kirby advanced his force into the Tar Heel state and camped at Warm Springs, a city adjacent the Tennessee line, and followed the French Broad River with his brigade of 900 infantrymen and an estimated 200 partisans, including rebel deserters who had pledged an oath of allegiance to the United States, two cannon, and a train of wagons. 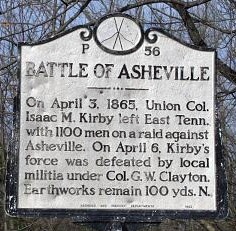 Kirby, leaving his field pieces and wagons at Warms Springs, cautiously approached Asheville on April 6 and, bar significant resistance, planned to sack the pristine mountain city, but Col. Clayton, a native of North Carolina who had also attended West Point, with a mixed force of 300 Confederates, including 175 of the faithful 62nd North Carolina, were determined to make a stand. To the west, 600 men of Thomas' Legion of Cherokee Indians and Mountaineers, a diverse unit of the rugged region, were stationed between Waynesville and Warm Springs (O.R., 49, 1, 31) and poised to engage any Yankee incursion in that vicinity. 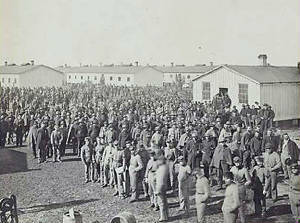 Clayton was assisted by a company of the Silver Greys and some Confederate soldiers at home on sick leave and furlough. The Silver Greys, consisting of senior and junior reserves, served as home guard and totaled 44 men, including a 14 year old boy and a 60 year old Baptist minister. 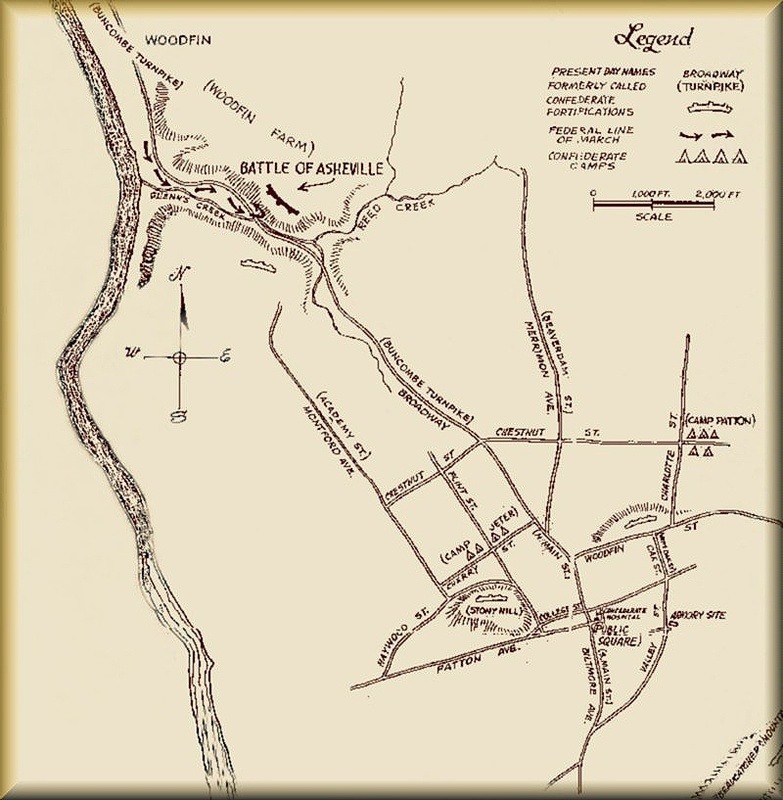 (Right) View of the Asheville battlefield. Confederate artillery was placed on the hills across the road. The battle's historical marker is also in center background. McConnell's brigade, meanwhile, was en route to support Kirby, who had opined that Confederate infantry of 1,000 to 1,500 with an additional 1,100 cavalry confronted him. So in a calculated move, Kirby ordered his men forward without the supporting brigade. At approximately 3 p.m., while the Federal brigade deployed, the rebels commanded positions on the ridge, causing the Federals to hastily confront them at short range (the location is currently known as Broadway Street). The battle commenced and the armies, with neither striving to gain the advantage, remained static and exchanged volleys until 8 o'clock that night. Although greatly outnumbering its foe, the Union army preferred to retreat, and the opposing forces reported but few casualties. Kirby's actions showed that he lacked conviction to press an assault on Asheville, not to mention capturing it, because he left his field pieces and wagons, having been filled with ten days' rations, some 30 miles to the north at Warm Springs, which allowed the Ohioan a quick exit should those imaginary 1,100 cavalry thrash his position. Absent was any maneuvering of his brigade, for he had ample time, five hours, to ascertain the position and strength of the enemy, which he later conceded was merely a small force of rebels with two cannons that entertained him from two positions on a hill. Whereas Kirby refused any flanking movement, he did perform a token demonstration before the Confederates, who had used the topography to its advantage. Perhaps he was hoping that the Confederates would exhaust their ammunition, or melt away like fluke flurries in the springtime, and then move toward the city in piecemeal fashion. But with the curtain closing on the final scene of this war, Kirby, by not pressing the Rebels, had also avoided additional unnecessary losses for both armies. And three days later, after General Lee surrendered the Army of Northern Virginia on April 9, 1865, the Confederates serving with Clayton in Asheville withdrew and returned to their homes, and they never swore the oath of allegiance as required by Federal authorities. Perhaps receiving some solace after four years of fighting, with the war having erased many of their comrades from their Southern communities, several veterans from the unit later commented that we didn't surrender, we just quit. Lt. Col. McDowell wrote that "No braver or nobler hearted men ever lived than those composing the Sixty-second North Carolina Infantry Regiment." 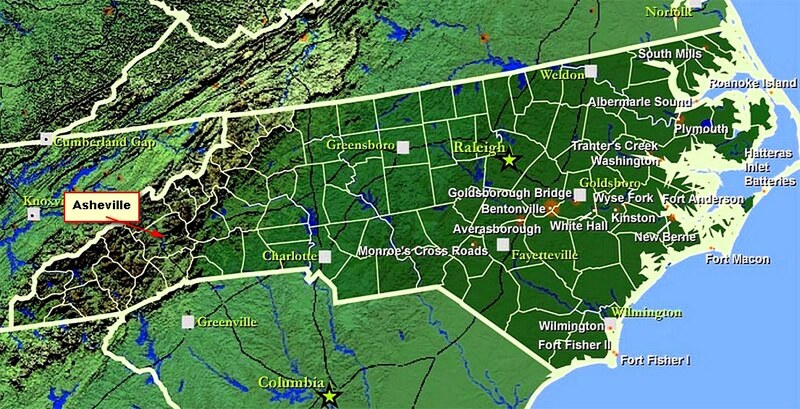 Notes: Numerous Loves, of the prominent North Carolina Love family, served in the 16th North Carolina, 62nd, and in Thomas' Legion of Cherokee Indians and Highlanders. The real Private W. P. Inman, portrayed by Jude Law in the movie Cold Mountain, was a Haywood County highlander who served in Company F, 25th North Carolina, and several of his brothers served in the Twenty-fifth and Sixty-second North Carolina. See also William P. Inman's Compiled Military Service Record (CMSR): National Archives. Sources: Official Records of the Union and Confederate Armies (OR), O.R., Series IV, pt. 2, pp. 732-734, O.R., Series 1, Volume 53, pp. 324-336, and O.R., Series 1, Vol. 32, pt. II, pp. 610-611; National Archives (NARA); Library of Congress (LOC); National Park Service: American Civil War (NPS); State Library of North Carolina; North Carolina Office of Archives and History; North Carolina Museum of History; Walter Clark's Regiments: Histories of the Several Regiments and Battalions from North Carolina in the Great War 1861-65; Weymouth T. Jordan and Louis H. Manarin, North Carolina Troops, 1861-1865; Joseph H. Crute, Jr., Units of the Confederate States Army; D. H. Hill, Confederate Military History Of North Carolina: North Carolina In The Civil War, 1861-1865; Forster A. Sondley, A History of Buncombe County (North Carolina), 2 vols. (1930).